“Prelude to a Kiss” has undoubtedly become one of the top jazz standards, but its evolution to greatness was slow. On August 9, 1938, Duke Ellington and His Orchestra, featuring Johnny Hodges, recorded “Prelude to a Kiss” for the Brunswick label. A second version was recorded fifteen days later for the Vocalion label. This time it was by Johnny Hodges and His Orchestra with vocalist Mary McHugh. Johnny Hodges’ “orchestra” was composed of members of the Duke Ellington Orchestra including Ellington himself. Mary McHugh was with the Ellington band in 1938, recording a little over half a dozen songs. Along with “Prelude to a Kiss” she was the first to record “Lost in Meditation” with Ellington. The public liked the Mills/Gordon lyrics, and the Mary McHugh rendition went onto the charts in October rising to number thirteen. The instrumental charted a week later, rising to number eighteen. Although “Prelude to a Kiss” is more popular with jazz performers today, Ellington’s 1938 million-selling “I Let a Song Go Out of My Heart” overshadowed both of its initial hit recordings. Rising to number one with both the Ellington and Benny Goodman orchestras, “I Let a Song Go Out of My Heart” stayed on the charts for nearly six months. [Hodges] is particularly known for a romantic approach to ballad playing that has pervaded American music ...His work on “Prelude to a Kiss” typifies that side of his talents. This section suggests definitive or otherwise significant recordings that will help jazz students get acquainted with “Prelude to a Kiss.” These recordings have been selected from the Jazz History and CD Recommendations sections. Written in an A1-A2-B-A2 form, the melody in the first and third measures of each A section sidles down the scale five halftones in a chromatic decline while the fifth measure starts out with a note repeated four times. The overall effect is a general flattening of the melody, drawing the ear to Ellington’s rich supporting harmonies. Like the Basie/Hefti classic “Li’l Darlin’,” this starts on the secondary dominant V7/V with a II7 – V7 – I sequence. The I, which contains a seventh at this point, is itself a secondary dominant of IV to which the progression continues. This same “circle of fifths” sequence is repeated a minor third lower, ending on a ii7 – V7 – I to which the composers add embellishing chords to delay the final resolution to I. At the end of the second “A,” the tonic is followed by a VII7 chord which easily modulates into the new key. In section “B,” a I – vi – ii7 – V7 progression is used along with its functional variant, iii – biii˚7 – ii7 – bII7. The modulation back to section “A” is a masterpiece of subtlety: it begins with what appears to be a I – IV cadence on paper (E – A in the original), except that the IV contains the minor seventh and a flatted ninth, clearly sounding as if it were going “somewhere else.” (The A7(b9) here is really a V7 of D, with the flatted ninth adding a strong hint of vii˚7 of D). The resolution turns out to be a Dm11 (the melody note is the 11th in this case). The harmonic progression rises two half-steps to Em11, then back down to Eb7, and eventually to the initial D13 in the first measure of “A,” while the melody continues upward, landing on the B natural that is the first melody note as well as the13th of the D chord. Texas tenor saxophonist John Hardee, a late, swing-era, rising star, unfortunately came along as jazz was moving into bebop. His style had a nice, Don Byas-type approach but was just too similar to other players, and he left New York, returning to Dallas. His 1948 recording of “Prelude...” shows that he had fine ability with a ballad, and the record also spotlights bop pianist Al Haig. 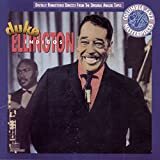 Composer Duke Ellington, in an unusual album as a featured solo player, recorded an excellent trio version of his tune in 1953. In a 1954 session with strings, “used to be Duke Ellington tenor player” Ben Webster pays homage to his former section mate, alto saxophonist Johnny Hodges, for whom the tune was a feature with Ellington. This is the original recording of the tune and it is an absolute gem. Different members of Ellington’s orchestra take turns playing parts of the melody, and we are therefore treated to a great demonstration of Ellington’s ability to balance lush, cohesive orchestration with the distinct voices of his musicians. Primarily known as a Dixieland player, Russell showed the jazz world on this recording that his always daring style was well-suited to playing in a more modern context. His reading of “Prelude to a Kiss” alongside valve trombonist Marshall Brown is stunning in its tenderness and melodic invention. Wilson sings with phenomenal warmth on this performance alongside such all-stars as guitarist Gene Bertoncini and pianist Hank Jones. The lyricism of Carter and Hall and the almost telepathic quality of their interplay with one another prove to be in perfect sync with the mood of this song. Backed only by her trio, Vaughan sings this tune with striking intimacy, though with complete mastery of the tune’s melodic twists and turns. The World Saxophone Quartet rendition of “Prelude to a Kiss” is energetic, spunky and even a little reckless at times, while maintaining the tune’s melodic sense and rich harmonies. Pianist Mehldau’s 10-minute arrangement of the piece is one of the most thoughtful and mesmerizing renditions of any song, let alone this one. Saxophonist Lovano is backed by an orchestra conducted by Gunther Schuller on this full-bodied track. The result is lush. The jazz group is given space to improvise in the foreground while enjoying Schuller’s support rather than direction. Chilean singer Claudia Acuna provides an upbeat rendition of the song. The tempo and her Latin vocals give the Ellington ballad a touch of the exotic. Pianists seem to love “Prelude to a Kiss.” Timmons takes it sweetly as a solo before bassist Sam Jones and finally drummer Jimmy Cobb join him. The other eight cuts are divided between standards and Timmons’ own witty compositions.